Bucks County authorities are searching for 4 young men who've been missing since last week. 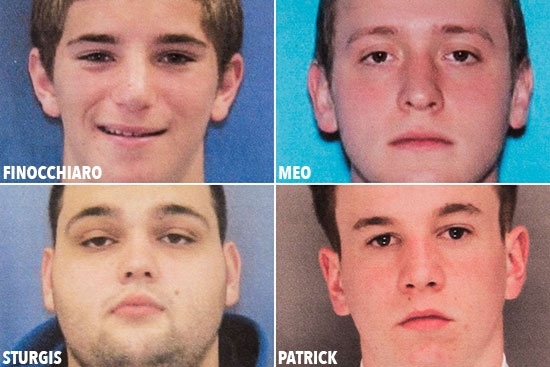 They have been identified as 22-year-old Mark Sturgis of Pennsburg, 21-year-old Tom Meo of Plumstead, 18-year-old Dean Finocchiaro of Middletown Twp, and 19-year-old Jimi Tar Patrick of Newtown. Patrick was last seen on Wednesday, July 5th. The other three were last seen on Friday, July 7th. In a press conference, District Attorney Matt Weintraub said they are treating the disappearances as a criminal investigation. They do believe that foul play was involved. He also said that they believe all four men knew each other. Police have been searching several areas. On Sunday night, they were at a home on Aquetong Road in Solebury Township. Today, police have been searching a wooded area on Upper Mountain Road near Route 202 in Solebury Township. That area is near Peddler's Village where the parent's of Mark Sturgis say their son's car was found early on Monday. Meo's car was found in the garage of the home searched on Sunday night. The Bucks County District Attorney's Office, State Police, and local police are all involved. Weintraub could not confirm whether the men were still alive, he said they are just trying to find them and asked for the community's prayers. If you have any information call 215-297-8201. UPDATE: 6:45pm - 20-year-old Cosmo DiNardo has been arrested and charged with a firearms possession offense from February. He is being held on 10% of $1 million bail. DiNardo was arrested at a home on the the unit block of Wayland Circle in Bensalem. It was one of the locations police searched on Monday. DiNardo's family also owns the home searched on Aquetong Road and a farm on Upper Mountain Road also searched on Monday. It is not clear how he is related to the 4 missing young men. A man has died after a shipping cargo container fell on his pick up truck in South Philadelphia around noon on Monday. It happened at 12:15 pm at the Packer Marine Terminal on the 3300 block of Christopher Columbus Boulevard. A crane operator was moving a container when it hit a separate stack of containers. One was knocked off and came crashing down onto the cab of the victim's truck. The 52-year-old man was pronounced dead at the scene by medics. An investigation is underway. Pennsylvania State Police are looking for a man who crashed a car and then stole the pickup truck of a Good Samaritan who stopped to help. It happened in the southbound lane of Interstate 79, near the Carnegie exit outside of Pittsburgh, on Sunday at about 2:30 p.m. The suspect was driving a stolen 2016 Kia and crashed into the guard rail. The Good Samaritan, a 54-year-old man from Claysville, Washington County, pulled over to help. The suspect jumped into the man's pick up truck and started to pull away. He tried to stop the suspect and was dragged about a 100 feet before he fell off. The Good Samaritan was taken to Allegheny General Hospital in Pittsburgh for treatment. His name and condition have not been released.